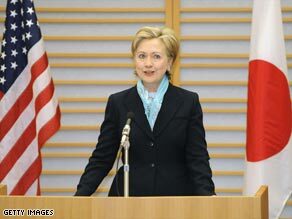 U.S. Secretary of State Hillary Clinton arrived in Japan Monday to begin a week-long trip through four Asian nations, looking to begin building new international relationships to help tackle some of the world’s toughest challenges. The backdrop for the visit is the global economic crisis, she said. All four nations are members of the G-20, which is composed of financial leaders of 19 nations and the European Union. The group was formed in the late 1990s to bring together key figures to help improve the world economy. The next G-20 meeting is in London in April. “I will be discussing with them the approaches that each are taking, explaining what we have just done with the passage of our stimulus bill, and seeking greater cooperation about how together we’re going to work our way through these very difficult economic times,” Clinton said. Will Beijing Respond to Clinton’s Wish List?